Search Engine Optimisation (SEO) is the act of getting your website as far up Google as you can for your chosen keywords. 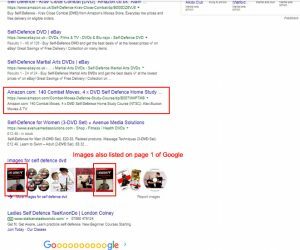 Google has many different tools to help with this and Word Press websites are designed to work with Google for best results. 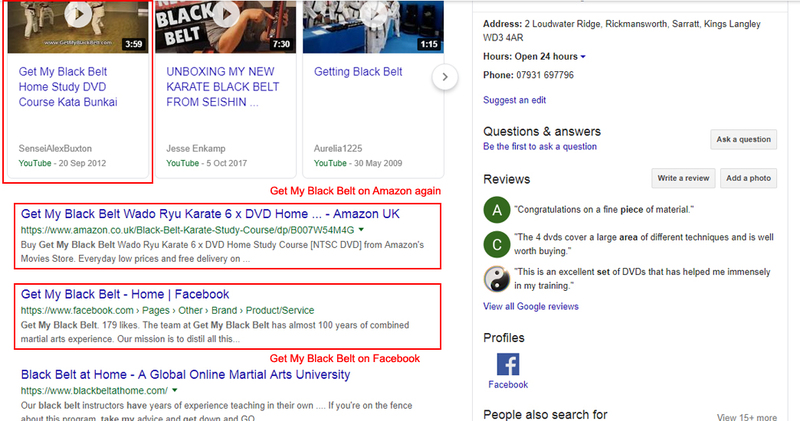 Not only do you need to be at the top of Google (or as close as you can), you should also list your business as a location. 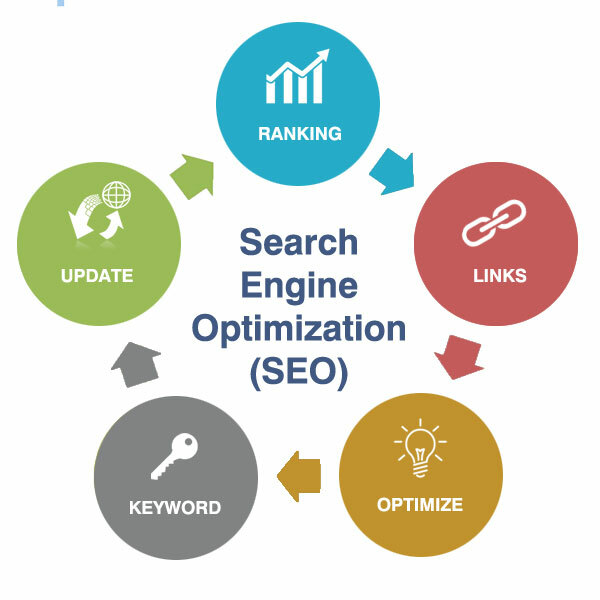 This means that people near you will find it easier to find you on a map. If you aren't on the first page of Google, you're nowhere. 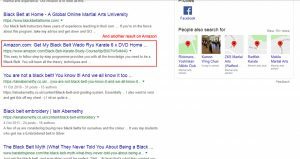 If you find yourself in a highly competitive field, such as Martial Arts DVDs, you need to be creative. 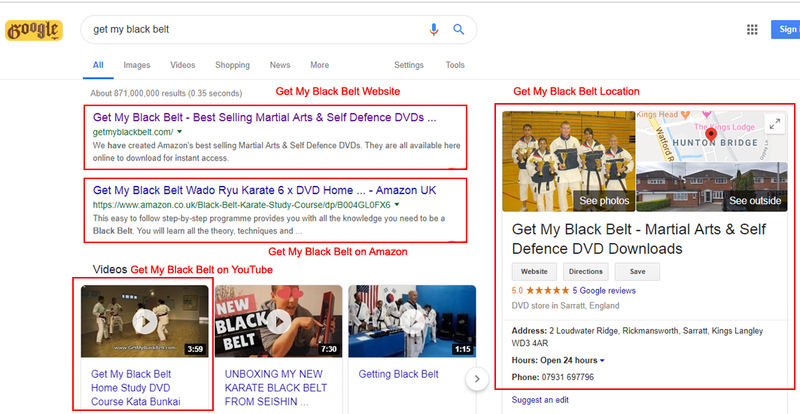 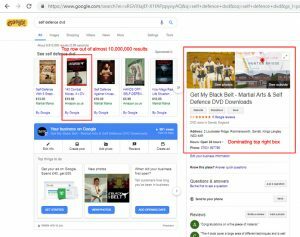 Dominate 1st Page of Google for Keywords "Get My Black Belt"
In this example, when searching for "Get My Black Belt", the www.getmyblackbelt.com website is in the #1 Google position out of almost 900,000,000 results. 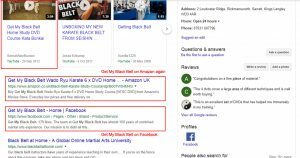 The website listed and so is the the YouTube Channel, Facebook Page, Amazon entry and Google Location. 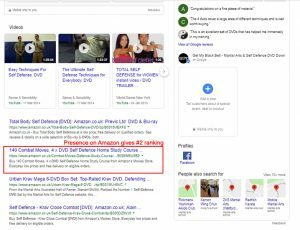 The front page of Google is dominated and it is very easy for a customer to find the products to buy. 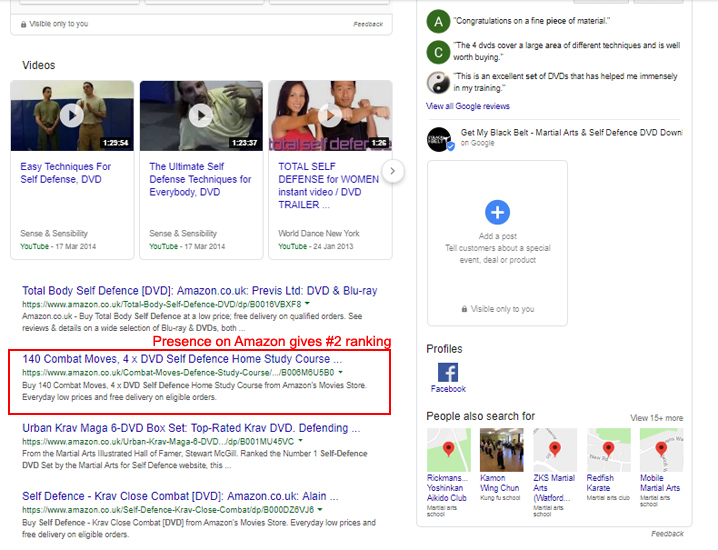 Dominate 1st Page of Google for Keywords "Self Defence DVDs"
In this example, when searching for “Self Defence DVDs”, even though the www.getmyblackbelt.com website does not appear on the front page (it's currently on page 3), the products are all over the front page. 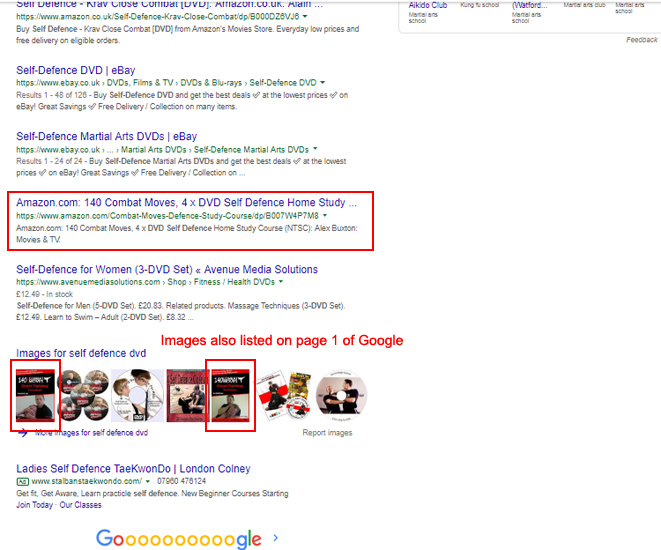 Below are screenshots running down the first page of Google and you will notice I have leveraged images, products and other websites such as Amazon to ensure the DVDs stand out and are easily found by customers. 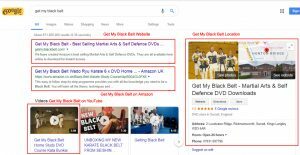 Luton Higashi Karate Club is a different example as it sells a local service rather than products which can be sold internationally. 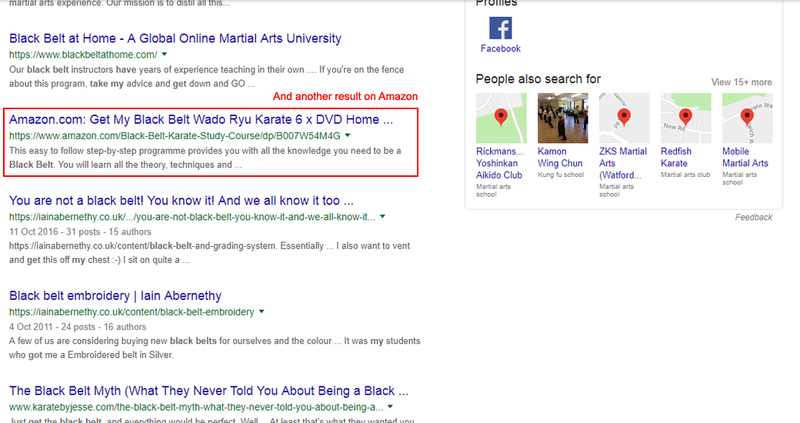 It is a less competitive field but it is competitive nonetheless and it pays to have the coveted #1 spot on Google. 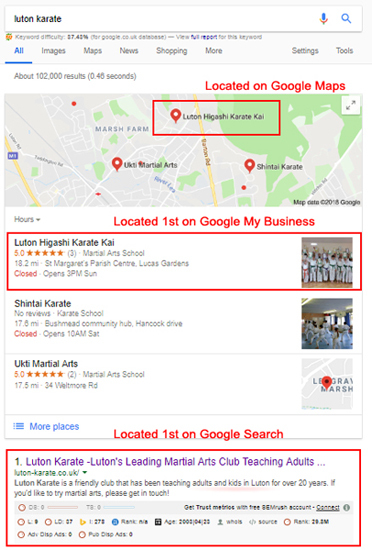 Google has placed Luton Karate on the top spot of the map and also the listing.